Tea Tree Body Wash £6.50 This bottle of soap free tea tree goodness has featured several times here on BBA. This body wash is great at removing post workout grime, leaving my skin refreshed and super clean without leaving my skin dry, stripped or smelling like disinfectant. It also makes a visible difference if any pesky spots occur on my body. I do find this wash works best with a body polisher as it doesn't lather well on its own. Tea Tree Night Lotion £10.00 I have a very good relationship with Tea Tree and as I was yet to try The Body Shop's Tea Tree Night Lotion I popped it into my online shopping basket. This lightweight overnight lotion has been clinically proven to give clearer-looking skin. Like most of the products from the Tea Tree range, it reduces redness and spots within a couple of uses. However, it can leave my skin feeling a little tight, but I haven't as of yet found it to be drying come morning. 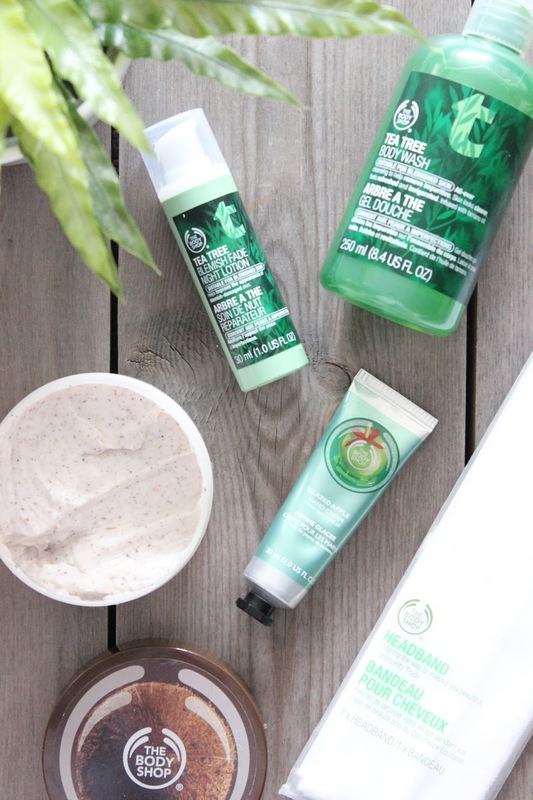 Glazed Apple Hand Cream £4.00 If you were a reader of BBA this time last year, you may recall how obsessed I became with The Body Shop Glazed Apple Shower Gel. The Glazed Apple collection smells incredible and is possibly one of my all time favourite scents - it's mouth-watering. So as soon as I saw the collection available online, I picked up the hand cream in the hope it may encourage me to look after my hands this winter and it hasn't disappointed. White Headband £4.00 It can be frustrating getting product in your hair during a pamper session. So I thought I'd buy myself a white headband that can be used whilst cleansing & pampering. The soft, white, washable headband is well elasticated, comfortable and well, practical!